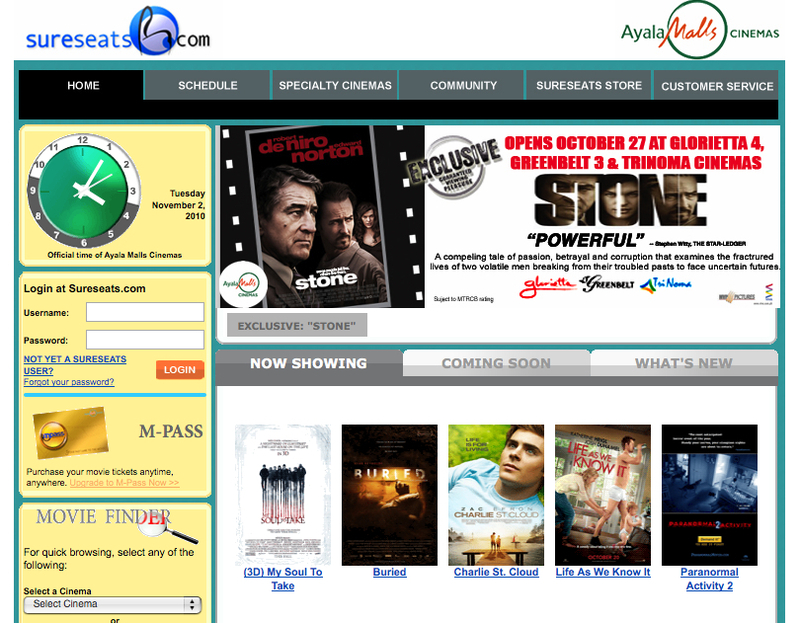 Home / TALK OF THE TOWN / Experience Ayala Malls Cinemas' SureSeats.com! 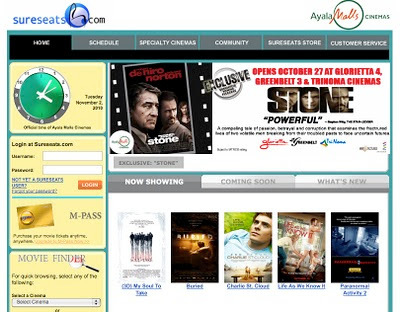 Experience Ayala Malls Cinemas' SureSeats.com! Gone are the days of long queues to get tickets from movie ticket booths and fast food chains for snacks as the Ayala Malls Cinemas' SureSeats.com has upgraded its features and services with the recently concluded successful relaunch of its newly improved Web site last October 27, 2010 at Greenbelt Cinema 3. The Ayala Malls Cinemas people held a press briefing and website demonstration to invited guests to witness the event and to personally experience SureSeats.com. MovieNews.me did not miss this once-in-a-lifetime opportunity so we attended the event, hit the road, and head our way to Greenbelt Cinema 3 that day. Ayala Malls Cinemas has been in the forefront of innovations in movie watching experience. Fully online since 2001, SureSeats is the first movie ticketing site in the Philippines that allowed moviegoers to buy tickets and reserve seats via the Internet. In 2003, they have added the M-Pass card feature of the Web site – a prepaid and fully reloadable card that allows online movie ticket purchase. SureSeats now enjoys being the top of mind go-to site as the only online movie ticket reservation site that guarantees seats ahead of time. Such service is a hit especially among M-Pass cardholders and is most appreciated when purchasing fast-selling tickets for blockbuster films. Taking the moviegoing experience onto a higher level with its major 2010 upgrade, SureSeats.com makes one’s workstream easier as it puts behind worries of queuing and waiting in ticket booths to finally get those coveted movie tickets. With its latest movie-friendly interface design, SureSeats.com leads the moviegoers to the fastest and most efficient online access to movies and now, even movie snacks! All you have to do is login to SureSeats.com, register a username and password, sent a confirmation message via text, and you are all done. You can now reserve seats and buy your tickets online. 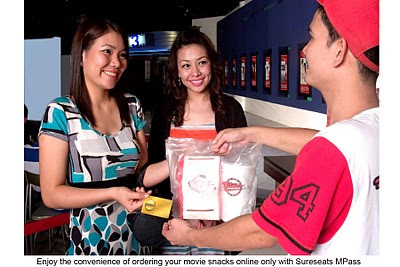 The enhanced SureSeats.com Web site lets M-Pass cardholders to purchase movie tickets and movie snacks in participating snack bars online, further delivering total convenience to movie aficionados. Just check out the SureSeats Store tab at the site. The M-Pass being a prepaid service allows one to pay for the movie tickets and movie snacks ahead of time. With the M-Pass, the cardholder gets past the long lines in ticket booths and conveniently goes straight to the cinema of choice for the pre-booked seats of the movie. Regular SureSeats users of Non M-Pass cardholders, on the other hand must claim their reserved tickets 45 minutes before screening time at the SureSeats lane. Coming from home or office – it frees the patrons from cut-off worries both in ticket booths and snack bar queues. It must be remembered that purchasing tickets and snacks online are applicable to M-Pass cardholders ONLY. Regular users of the Web site can only reserve tickets and seats, pay their tickets and get it from the booth before entering a cinema. However, an M-Pass cardholder gets a V.I.P. treatment. Just show the confirmation code of your selected movie that you purchased online along with your M-Pass card, and enter the movie house without the hassle of lining up. Ain't that the best way to watch a movie? Ayala Malls Cinemas makes seats and tickets more conveniently accessible to its moviegoers for SureSeats can now also be accessed via SMS by texting SURESEATS to 2910 (Globe and Smart Subscribers), I-Can’s mobile apps for BPI and Bancnet Account holders, and downloading SureSeats widget at Nokia’s Ovi Store. Just make sure you have registered first at www.sureseats.com. So, what are you waiting for? Be a part of the fast-growing SureSeats community and speed-click your movie tickets with the M-Pass Card available in all Ayala Malls Cinemas – Glorietta 4, Greenbelt 3, Alabang Town Center, Ayala Center Cebu, Market!Market!, Trinoma, and Marquee Mall at Angeles Pampanga. It's movie going experience with an ease. Guess what? I already registered my M-Pass card just now and will soon experience buying movie tickets online without the hassle!